After your course is done (or particular students have completed it), it's time to finalize! Finalizing a student or a course submits the students' final grades as part of their permanent academic records. 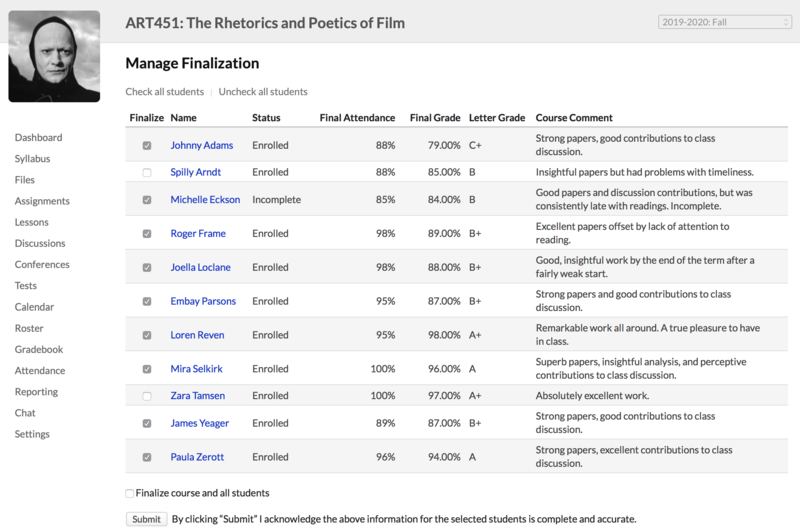 You can get to the Manage Finalization screen from the Info view, the Gradebook, or the Final Grade screen. After you finalize an incomplete student, you can come back at any time to enter grades for him. You cannot unfinalize a course—if it must be done, you'll need to ask the registrar to do so for you. Read more about finalizing your course..